UNWELCOME- W.I.S.E. Project 2016 – Dancing in the rain! I have been absent from here for 11 days, not a long time realistically but to me it feels like forever because I have been absent from my own life for at least half of that time. For some of the time I was reconnecting with friends and spending special time with my family but I had an unwelcome and unexpected visit from an aqaintance that knocked the wind out of my sails. This guest was as unwelcome in my life as your troublemaker Aunt Jean showing up at the potluck with her not so famous bean dip! DEPRESSION. MENTAL ILLNESS. YOU WERE NOT INVITED! I came to the conclusion that the only way for me to feel how I want to feel is to do the things I did before I was knocked off the horse. Be enaged in my own life and CHOOSE to be happy. Depression is cruel and unfeeling and it preys on amazing and intelligent people. Unlike me, those that suffer cannot just choose to be happy. They know how much they have to be grateful for, how much they are loved, how good that life can be, but when depression has a grip on them they cannot control how they feel. It is a sad, terrifying and helpless feeling to see someone you care about struggle with something they don’t understand and cannot control. In my last post I said that misery loves company but it won’t get mine. I didn’t invite this misery in, but I am going to try my best to usher it out. I know that I am worthy of the happiness I want to feel and I know that for me it is a choice. I had a dream the other night that an elevator door opened and I stepped in and fell down the shaft. I could look up from the bottom and see how far I had to climb to get out but part of me just wanted to rest at the bottom. Even in my dream I knew that saving myself was a choice. I can’t imagine what it would feel like to wake up everyday and feel like you had to drag yourself up that elevator shaft only to get knocked back down halfway. To work through that pain everyday and suffer it in silence so that nobody thought of you as “different” or pitied you. I know how fortunate I am in that regard because that luxury that I have is not afforded to everyone. That alone makes me feel ashamed that I have chosen to waste this day on Netflix, chocolate and tears but I guess we are all entitled to a moment. It certainly reminds me of why I started this project, it was to live in the moment, to be more mindful and choose happiness always. To choose it every single moment of everyday. There will be good days and bad days, that I know. I just need to put on my big girl pants and get back on the horse and hold on tighter this time! I am going to go dress up, and spend the rest of this beautiful family day with my youngest daughter. She gives me a million reasons to smile everyday! For those of you that are suffering in silence, please don’t. You are worthy and loved. Love yourself enough to seek help. If you or someone you know has a mental disorder, there is help available. Use these resources to get general information and find treatment services near you. Depression and mental illness doesn’t only affect those that suffer, it invades the lives of their spouses, children, family and friends. 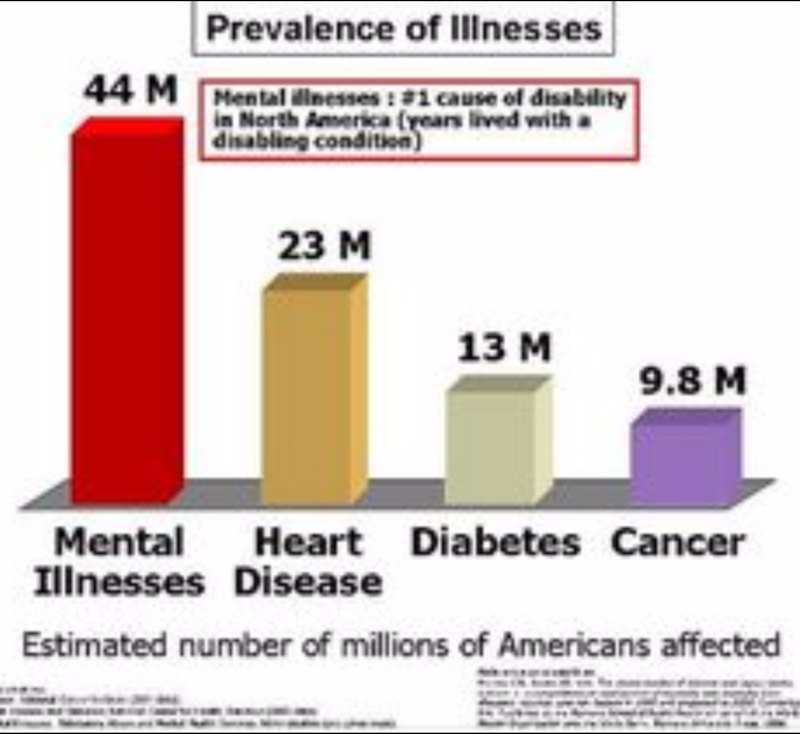 More people suffer from Mental Illness than Heart Disease, Cancer and Diabetes yet it remains an illness that is not discussed and often not treated. Just a reminder the Februarys W.I.S.E. Principles are Worthy, Inspire, Simplify and Empower. Be good to yourself. Take care of your health. Be W.I.S.E.